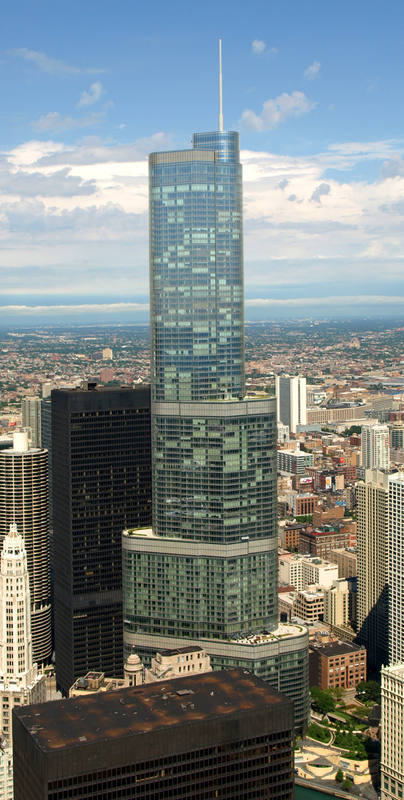 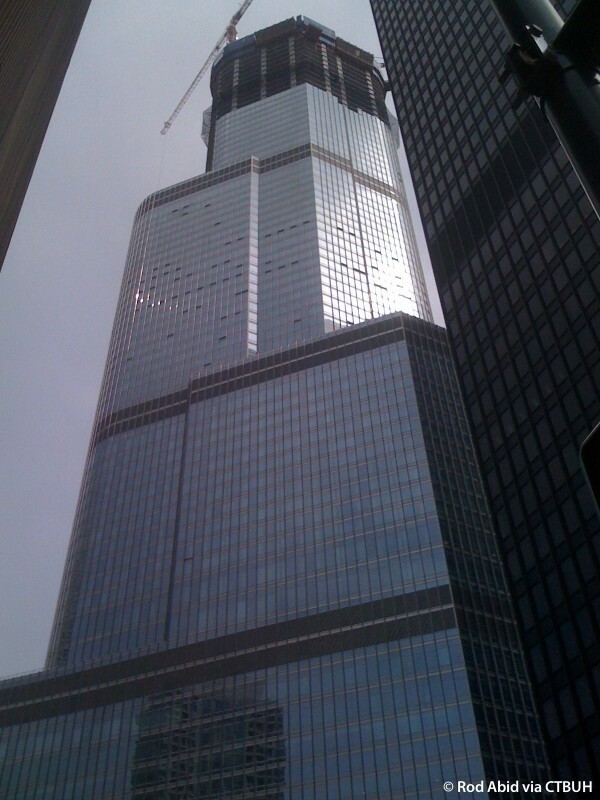 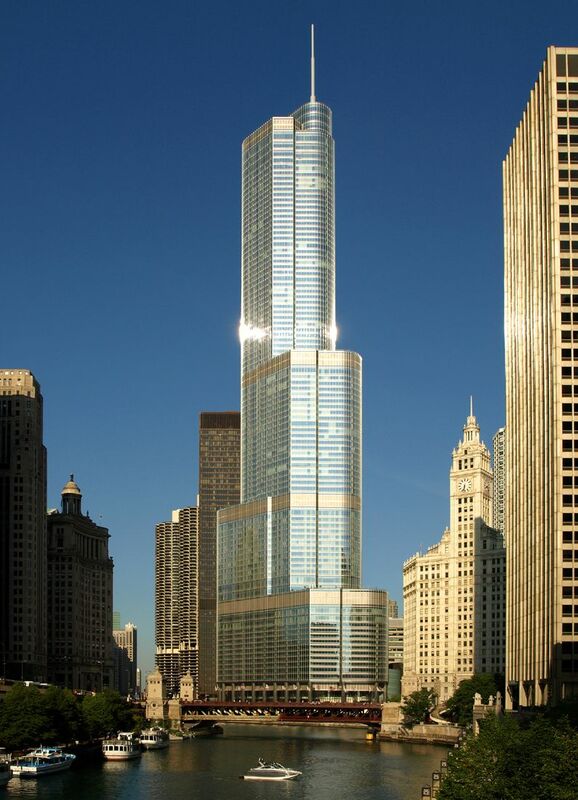 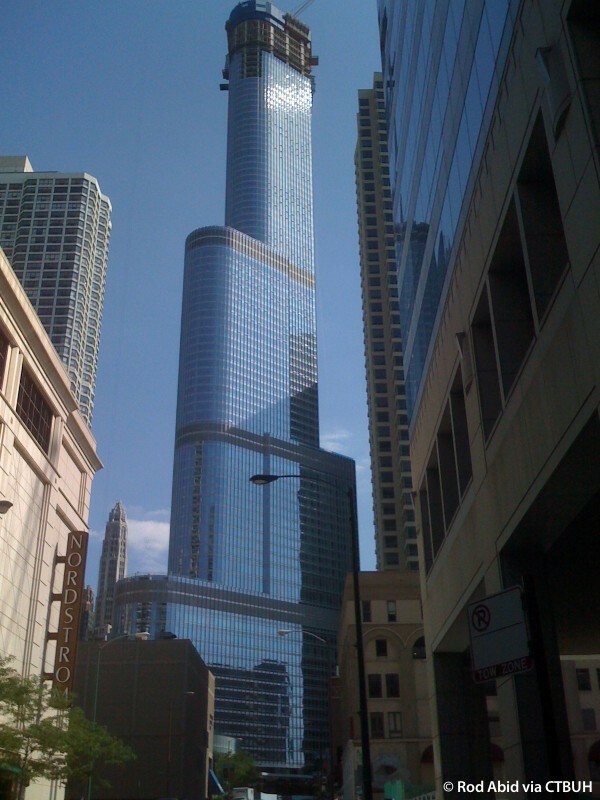 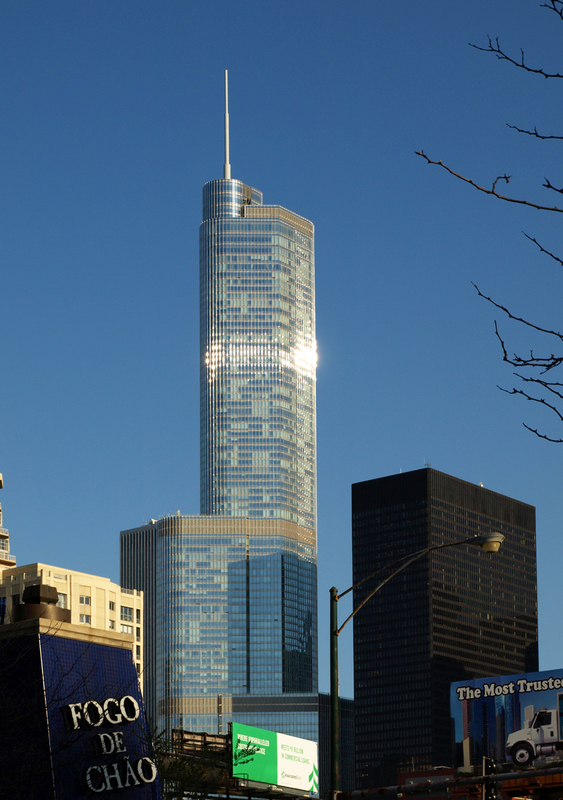 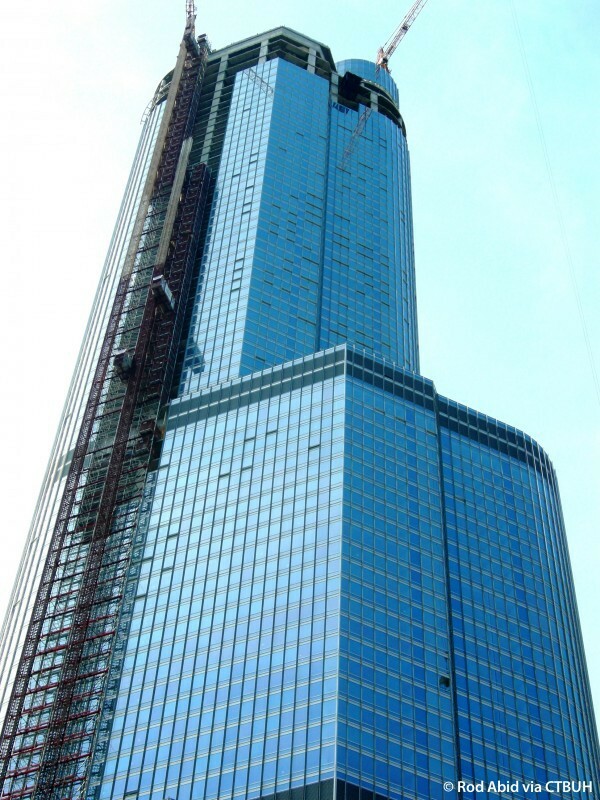 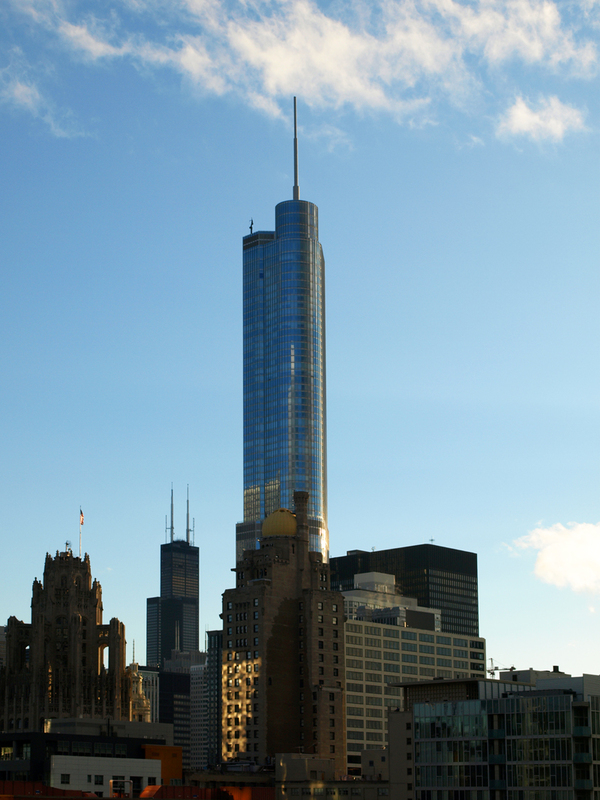 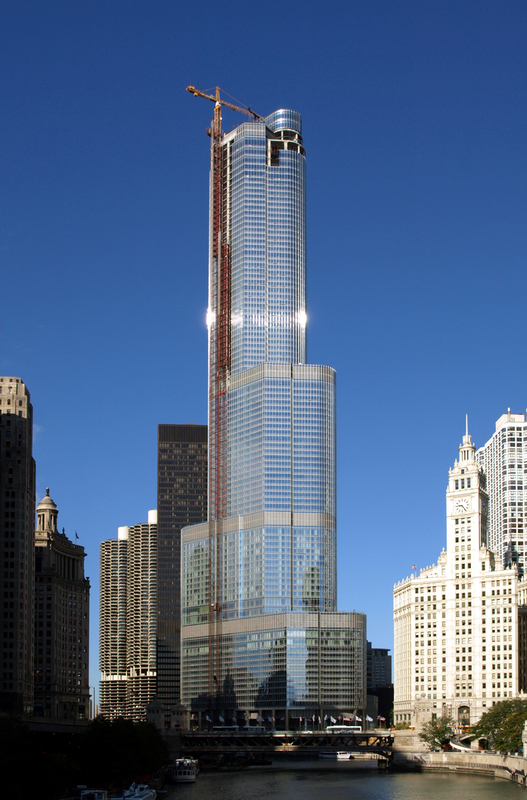 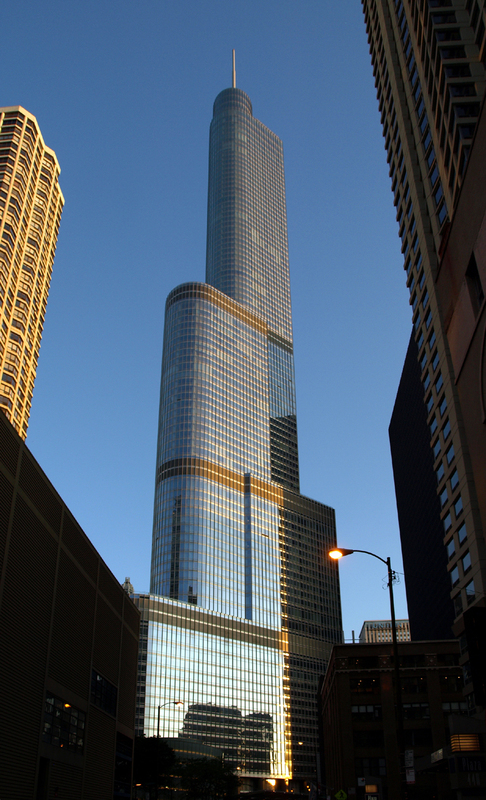 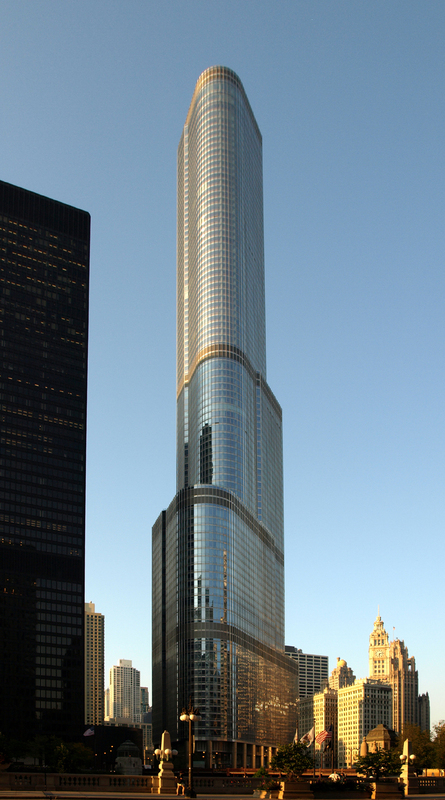 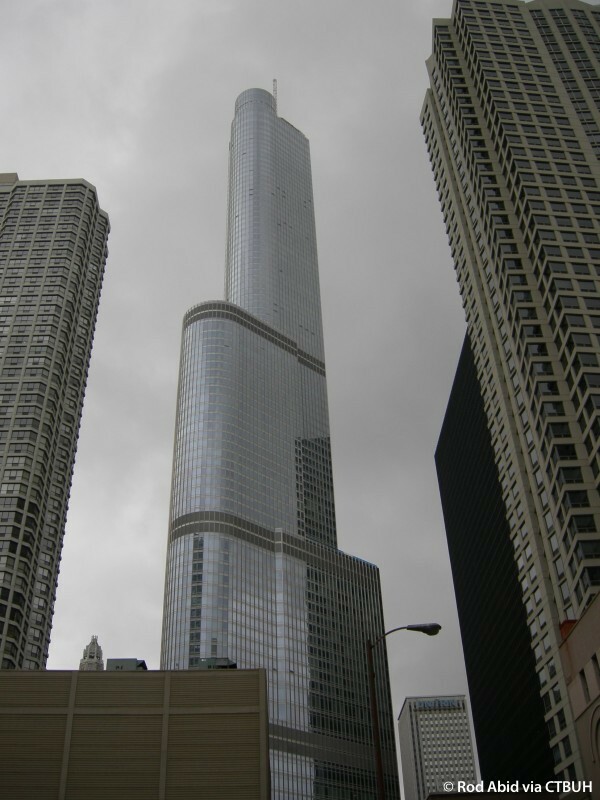 The Trump International Hotel & Tower stands at 401 North Wabash Avenue in Chicago, the site of the former Chicago Sun-Times building. 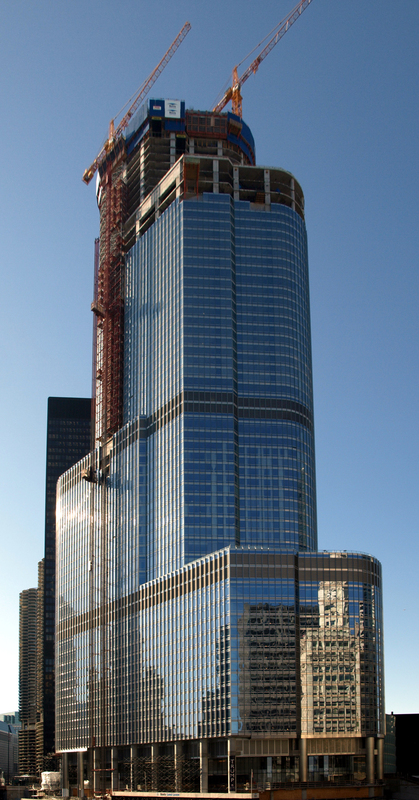 The tower includes the 339-room Trump International Hotel, 486 luxury condominium units, 9,300 square meters (100,000 sq ft) of riverfront retail space, 960 parking spaces, restaurant, banquet space, health club, spa, lounges and a ground floor beautified by a landscaped riverfront public plaza and a riverfront promenade. 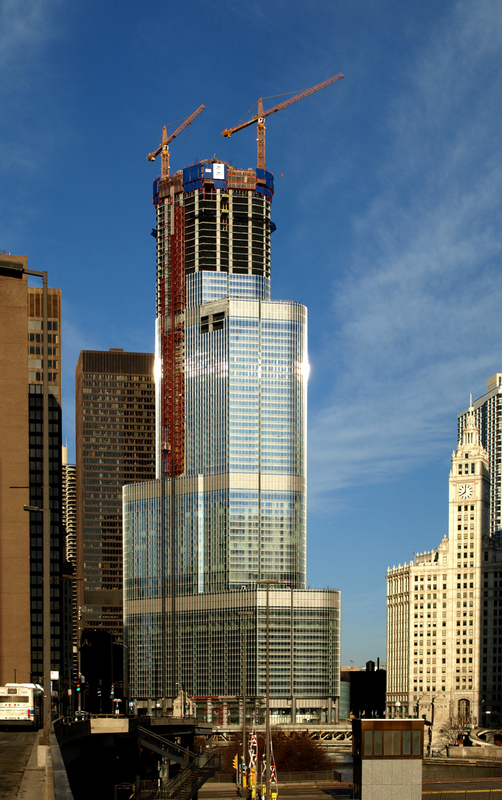 The tower creates a significant new addition to the Chicago skyline and changes the way in which individuals experience the Chicago River. 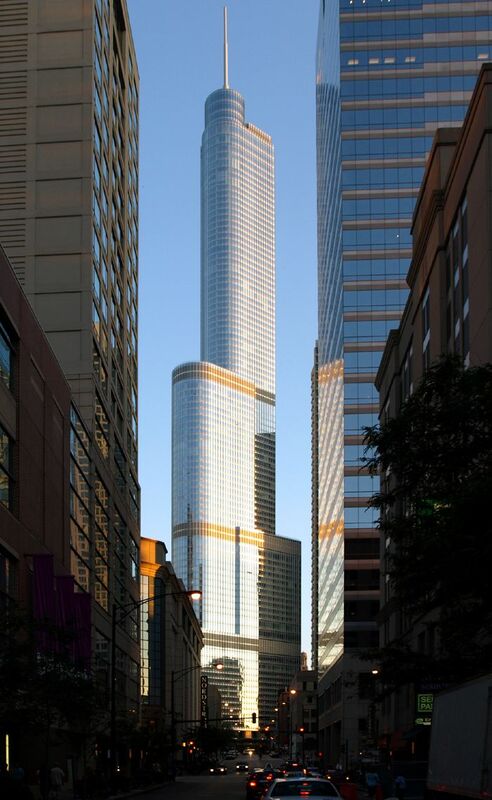 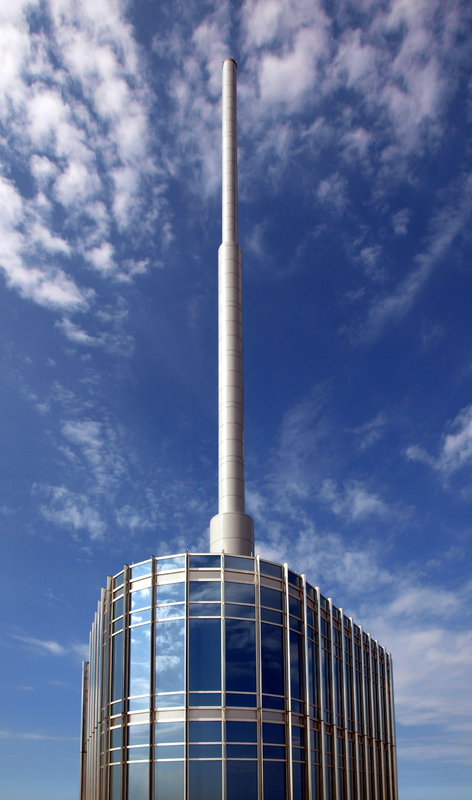 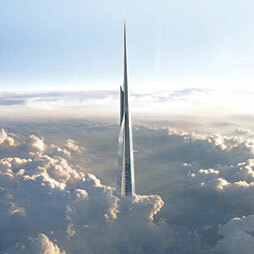 Shaped to reflect its orientation along the riverfront, the tower’s width is sensitive to its urban surroundings. 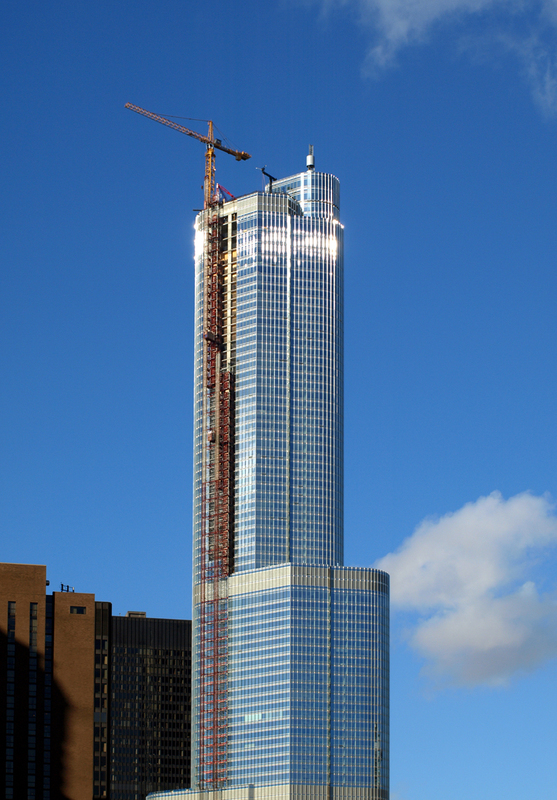 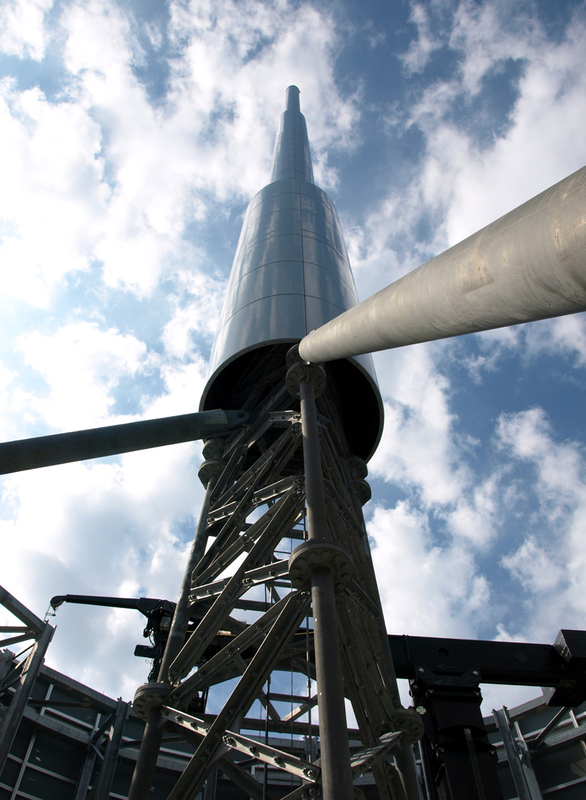 The south side of the tower parallels the river bank, enabling the structure to connect with Chicago’s north–south grid. 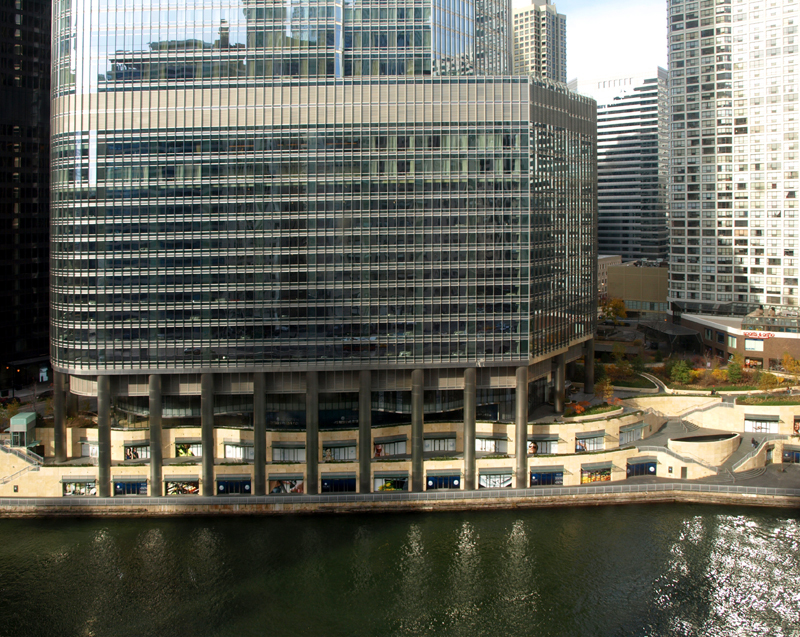 Adding to the tower’s sculptural quality, the building’s massing is lifted by 12 meters (40ft), opening up an expansive, landscaped promenade that steps down, like terraces on a hillside, for three levels until it meets the Chicago River. 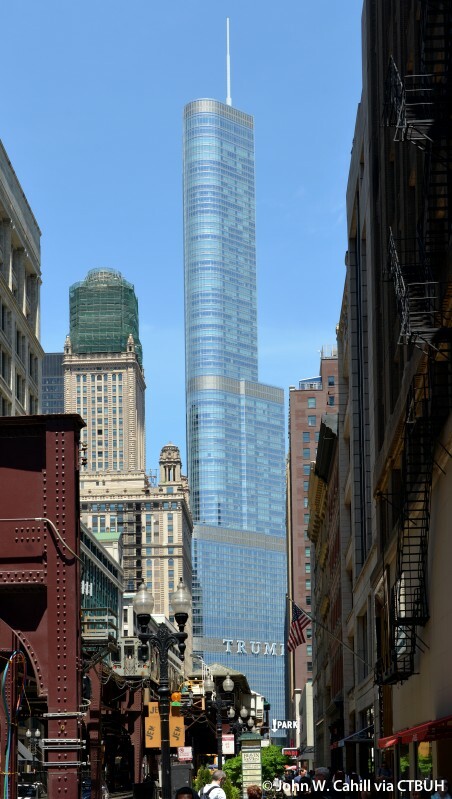 This promenade establishes a pedestrian connection between Michigan Avenue and State Street. 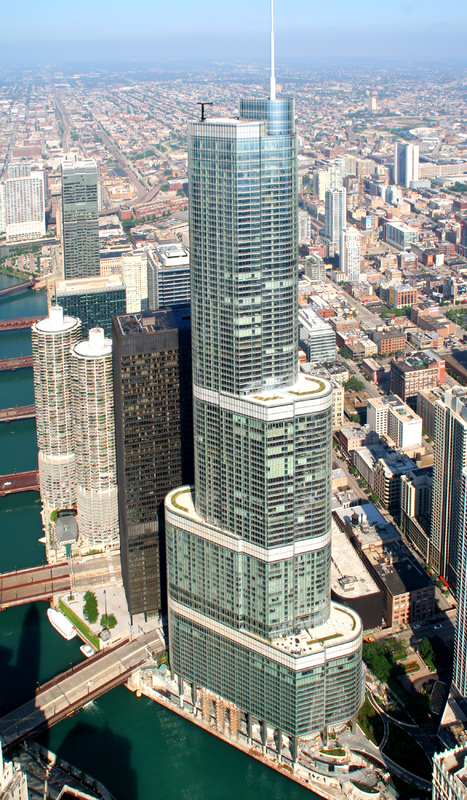 By providing public assembly spaces and retail activity at the river’s edge, the tower will connect two bustling areas together: North Michigan Avenue and the Loop. 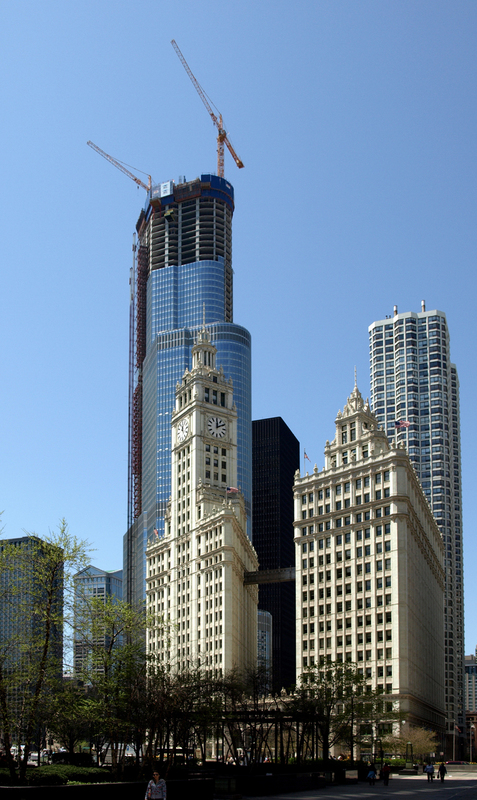 The tower relates to its neighbors through a series of setbacks, the first of which occurs on the east side, at a height that is essentially the same as the cornice line of the Wrigley Building. 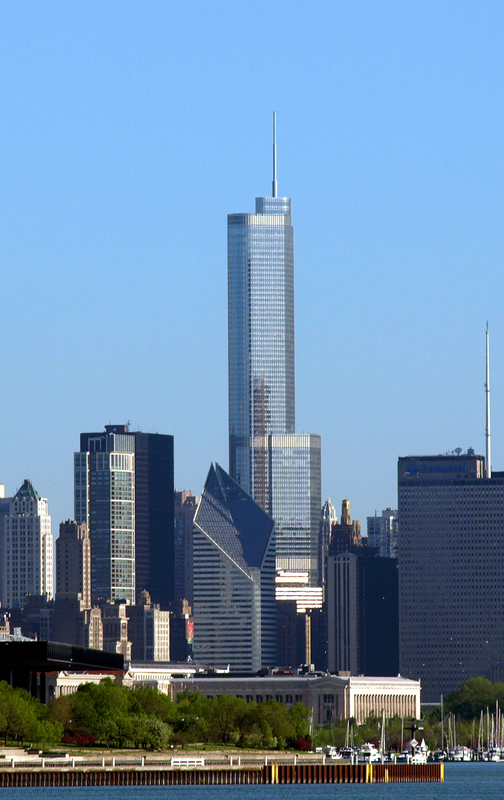 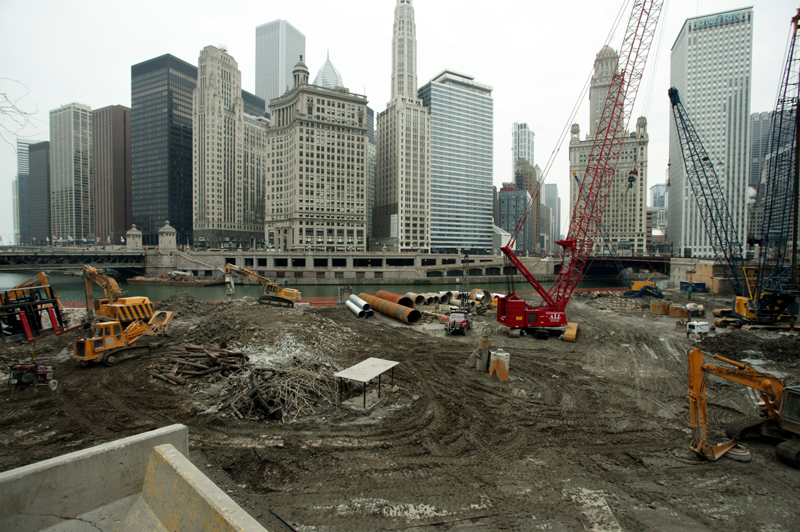 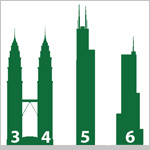 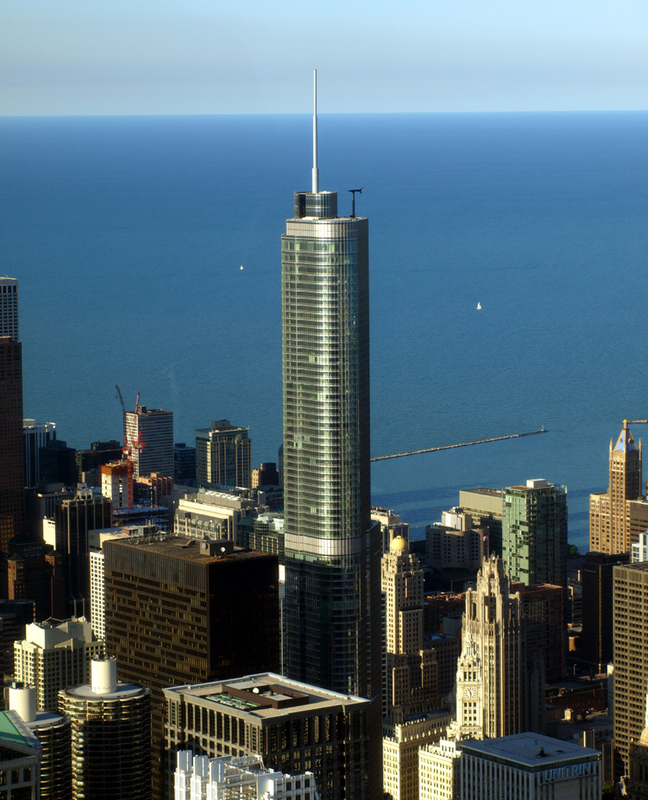 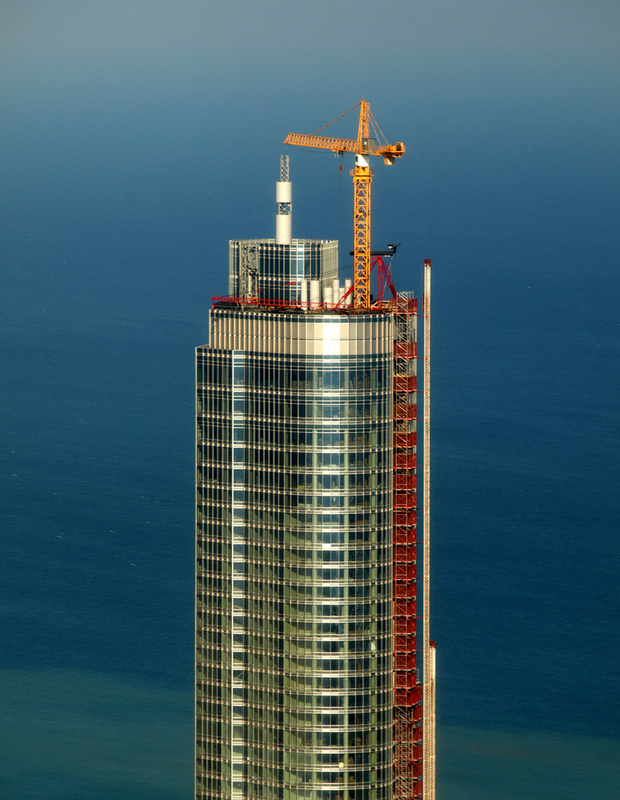 The next setback, on the west side of the tower, relates to both the height of the residential tower to the north and Marina City, to the west. 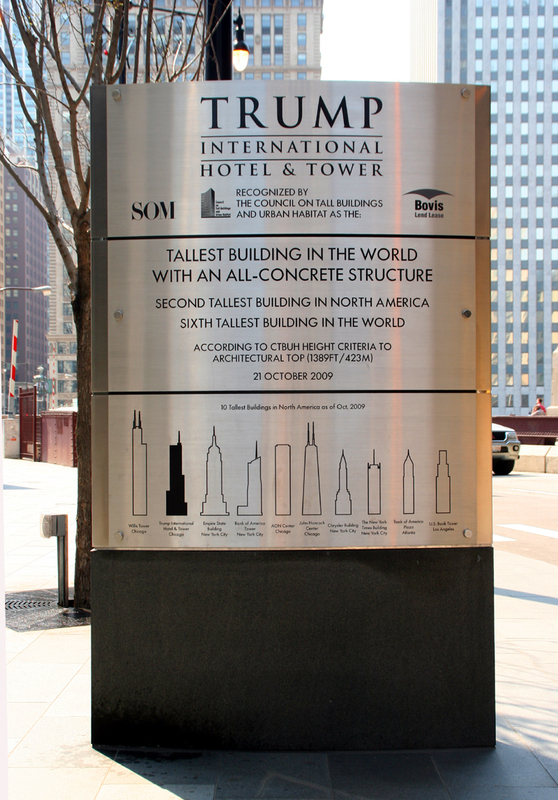 The third and final setback is on the east side of the tower and relates to the height of the IBM Building immediately adjacent. 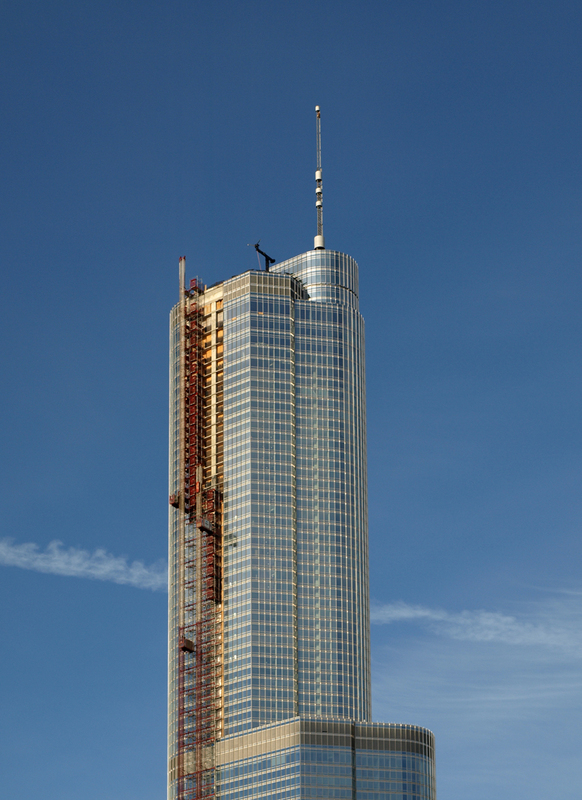 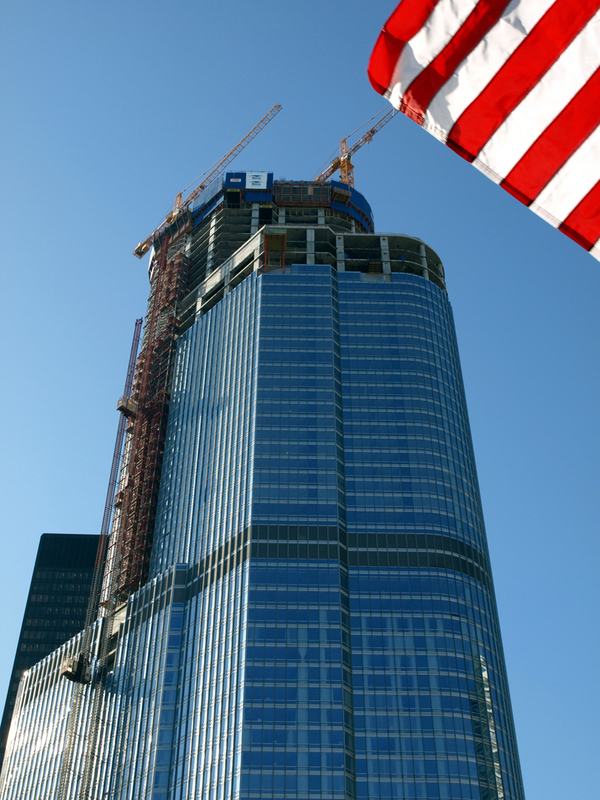 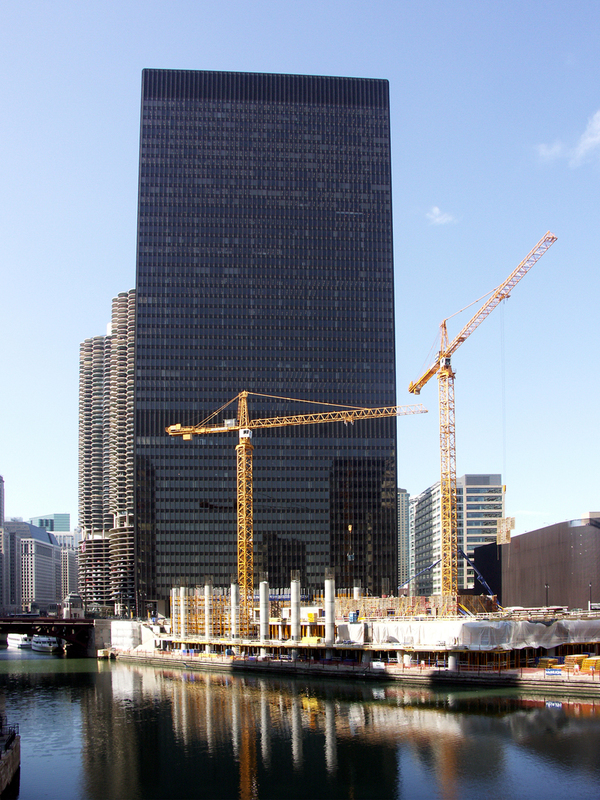 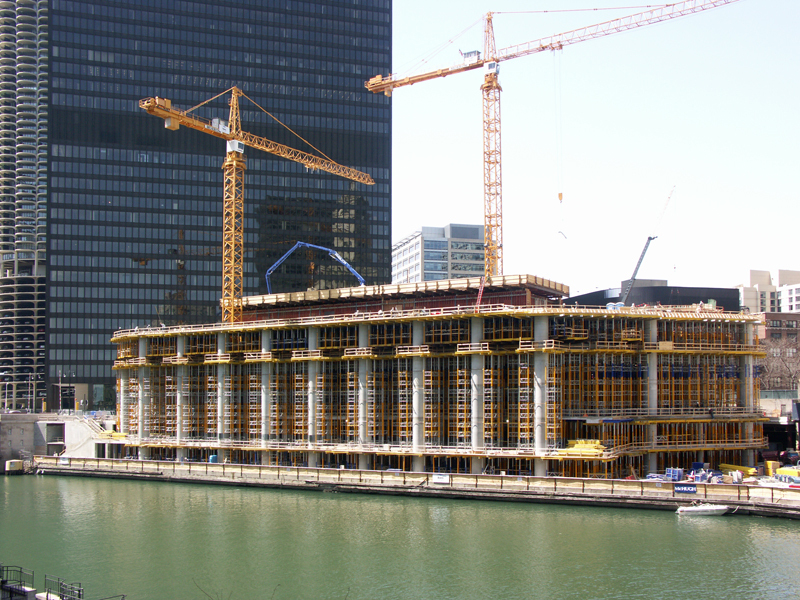 The lateral structural system for the Trump Tower consists of a concrete core and outrigger system. 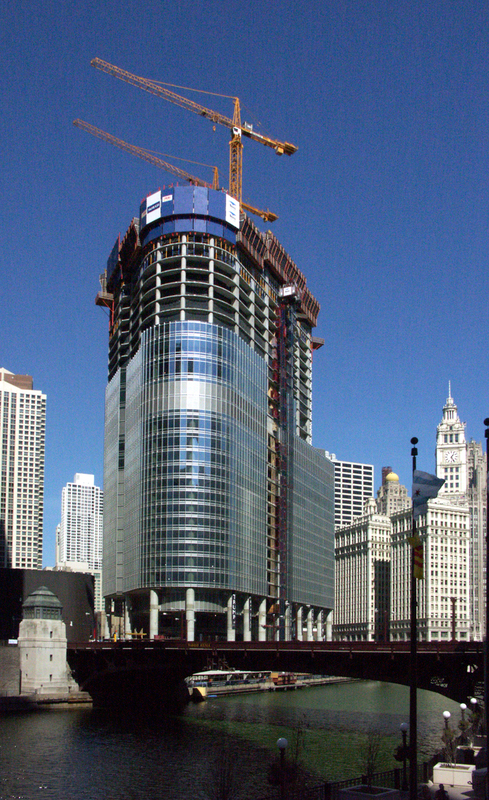 Concrete was chosen as the primary structural material to take advantage of its ability to provide a stiff frame with high damping. 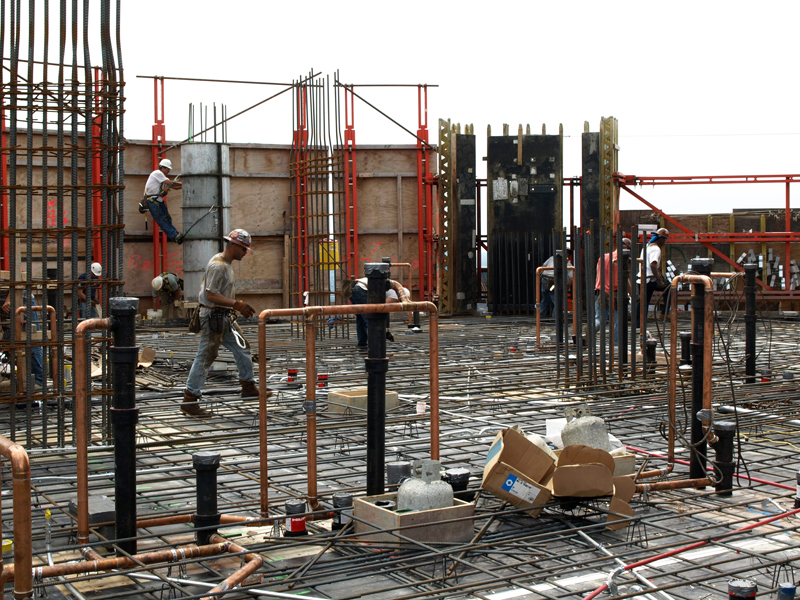 The tower foundation consists of a three meter (10ft) thick mat supported on rock caissons. 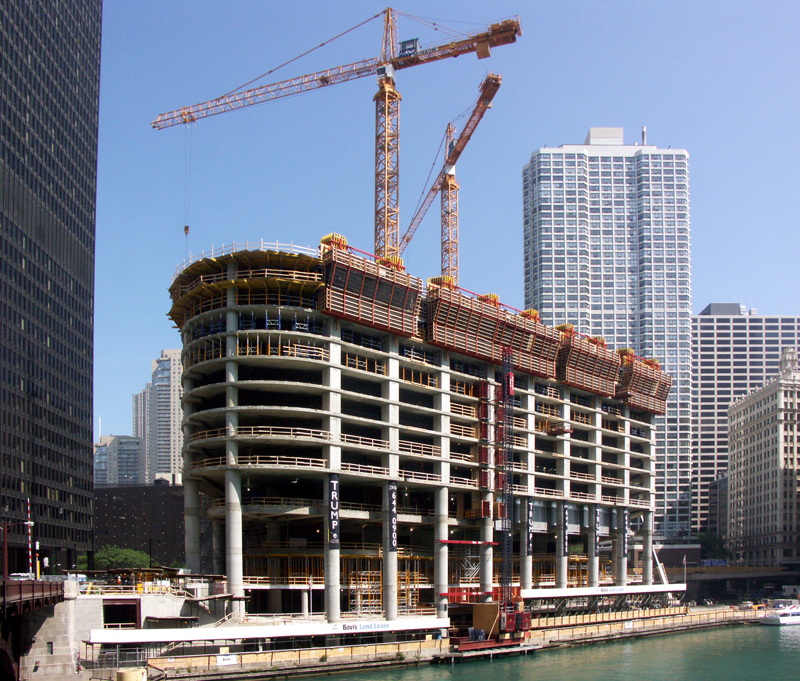 It is believed that the 3,823 meters cubed (5,000 yd3) mat foundation pour represented the largest single self-consolidating concrete placement in North America to date. 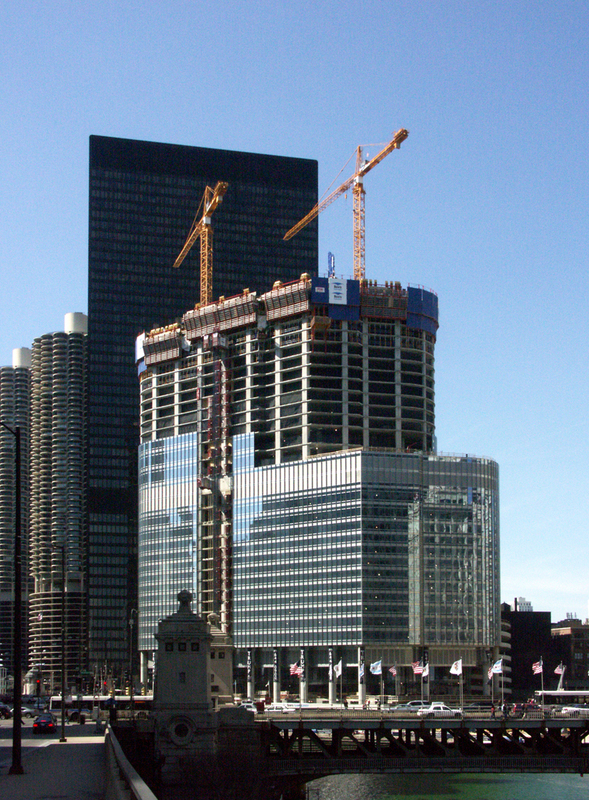 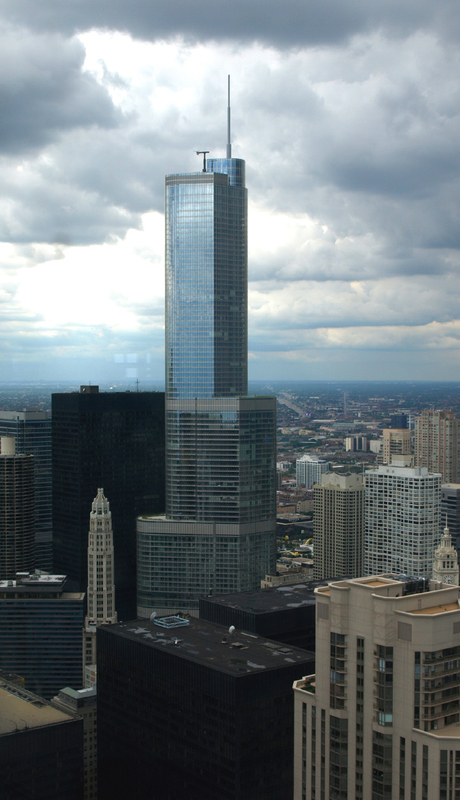 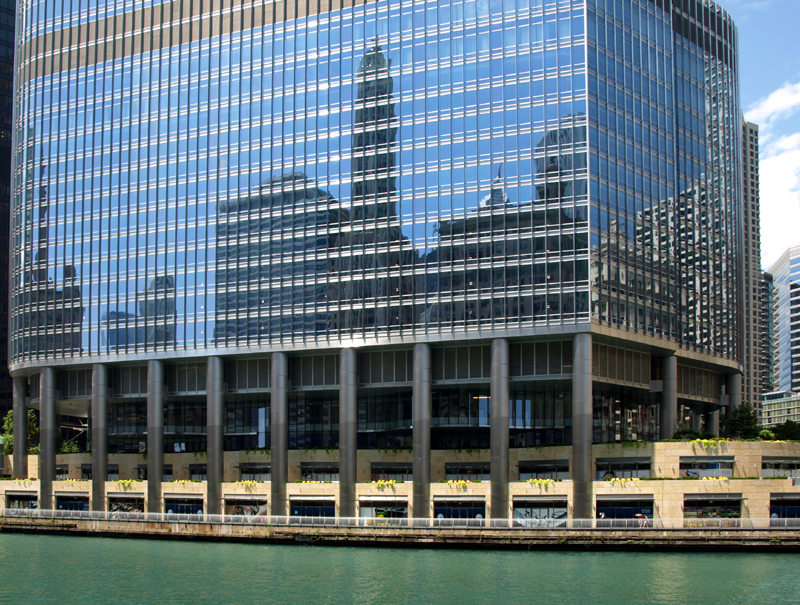 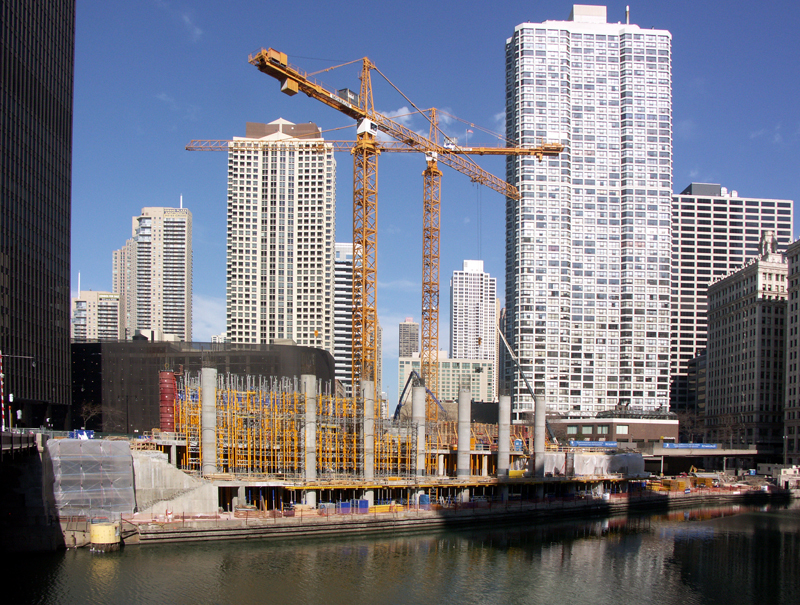 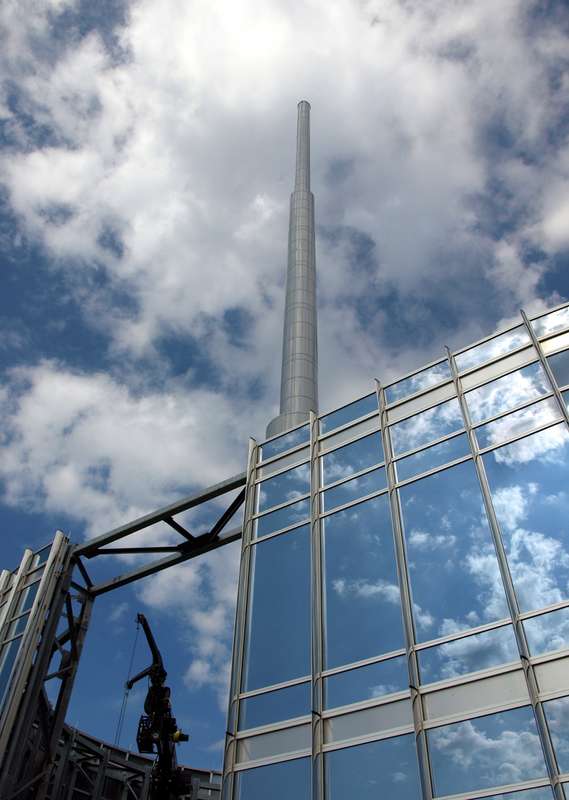 As part of the tower’s sustainable strategy, Chicago River water is used to cool the building. 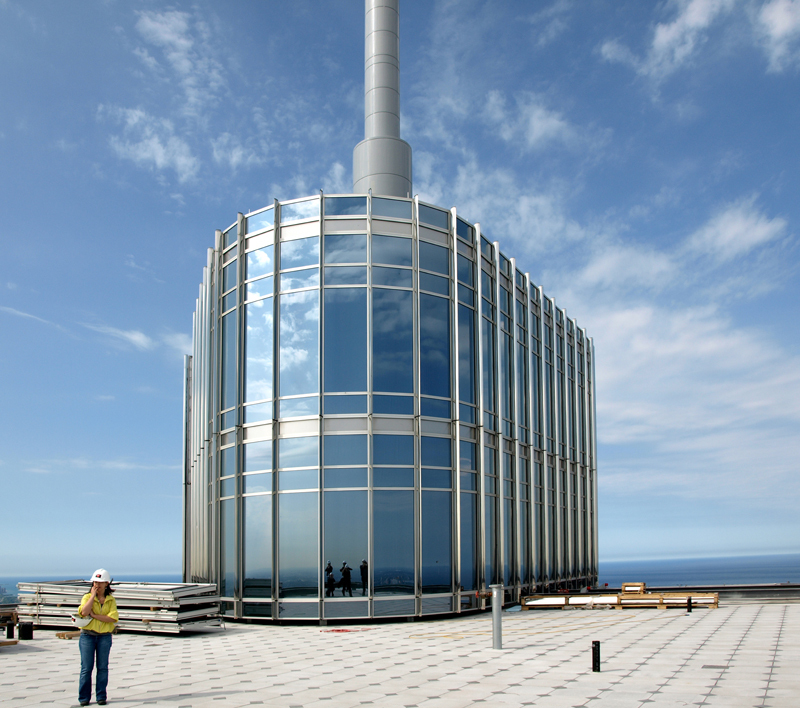 The building’s cooling system returns the water back into the river, unlike buildings with conventional cooling towers. 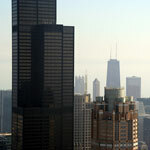 A computerized-control system regulates the temperature and ventilation of the building, determining how much the air must be conditioned. 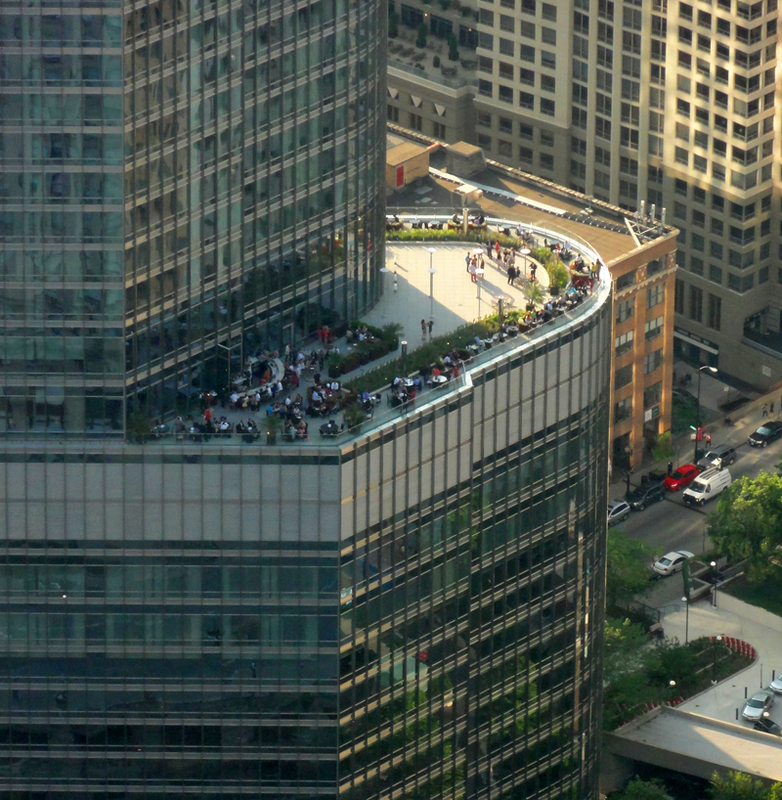 Partial green roofs can be found on the tower’s terrace levels. 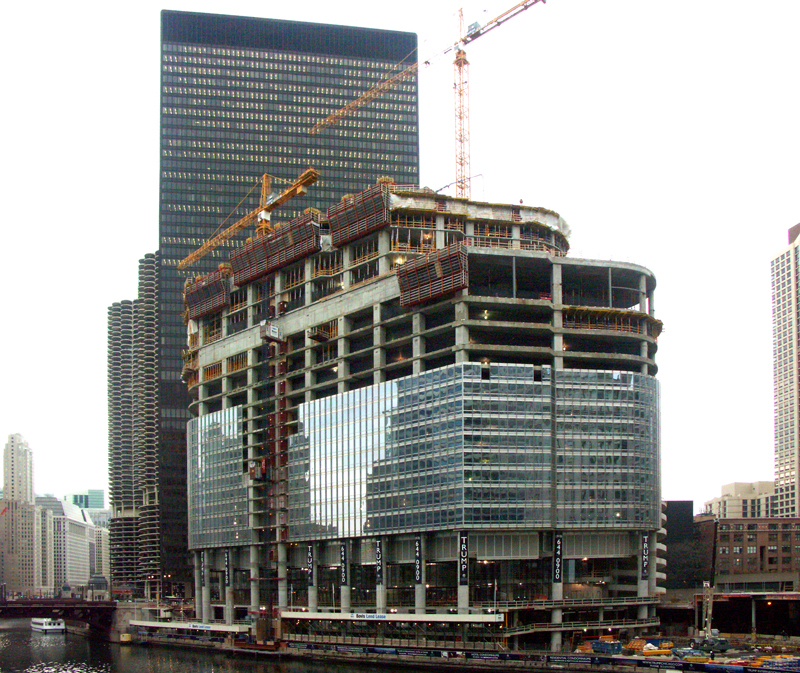 Each of the 3 meter by 1.5 meter (10ft x 6ft) curtain wall panels are made of thermal-pane glass encased in aluminum, with a thermal coating that helps retain heat in the winter and cool air in the summer. 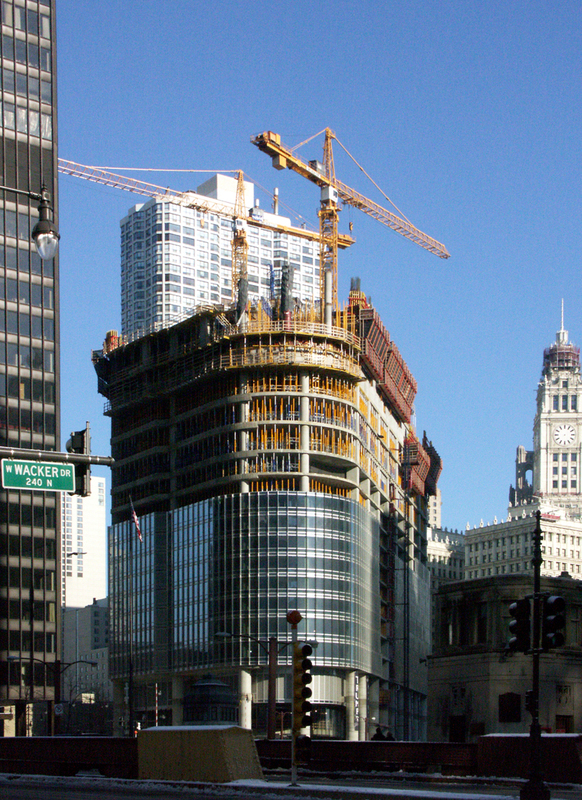 Early on in the design and development of the project, the client identified the desire for a project with phased occupancy. 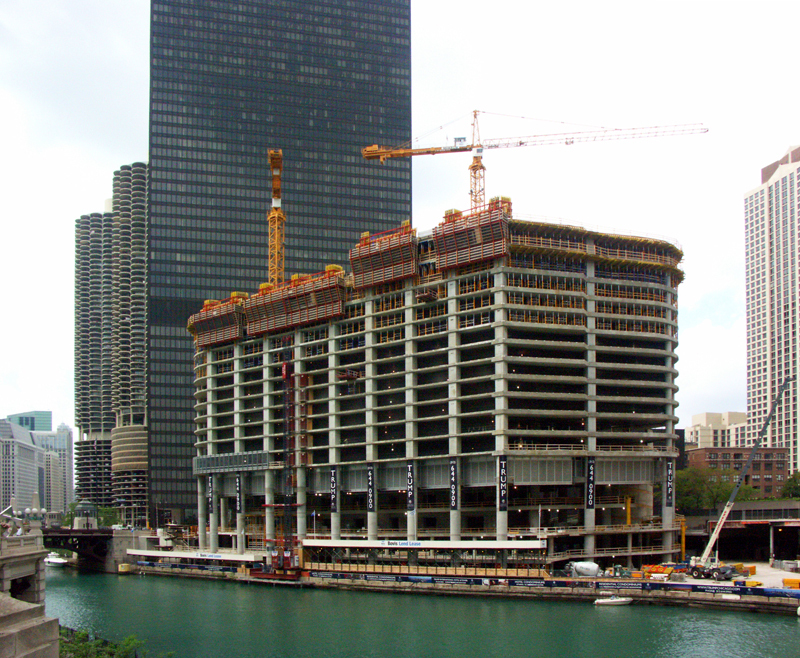 The occupancy phasing was incredibly unique—while the bottom 30 floors of the hotel were completed, occupied and functioning, construction continued on the remaining 60 floors. 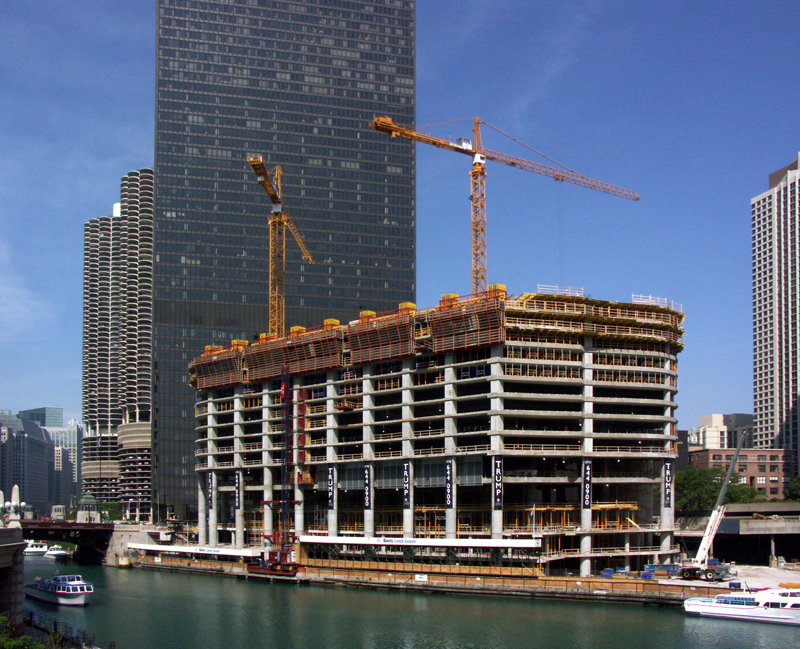 This phased occupancy required a concerted effort of the project management staff to meet regularly with the City of Chicago inspectors and Building Department heads. 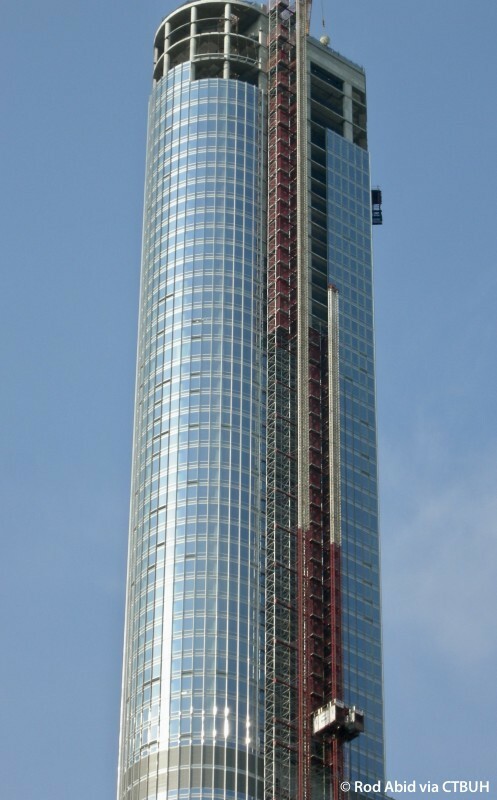 Following a rigorous nomination and review process, the CTBUH is pleased to announce distinguished Korean Professor Sang Dae Kim as the next Chair of the Council. 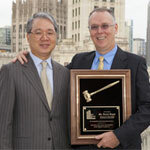 During the 8th annual Awards Dinner, David Scott passed on the chairman’s gavel to chair-elect Sang Dae Kim of South Korea.